Hi-Feed Milling at 600 ipm! Latest advances in tool technology make milling of high carbon and tool steels as reliable and predictable as benign aluminium alloys. In this video a large 4140 steel component is being roughed out at 2700RPM and 600 inches per minute. While achieving impressive material removal rate (20 pounds of steel machined off in a matter of half an hour!) the tool life puts the old school square shoulder endmills to shame. Yes, it could(and should) have been machined using a bigger cutter, but I wanted to put the tool to the test. I have to say my program now knows about machining more than i do. I certainly can not remember cutting speeds and feeds, reduction factors, depth of cut and a ton of other information for every material I have ever cut. Now add to that the various possible combinations of tool/material/coating and it becomes a no brainier, that a good speed and feed calculator like HSMAdvisor saves a ton of time and money by improving your tool life and productivity. It is not only good for HSM (High Speed Machining) but also for general machining, drilling tapping, you name it. The algorithms it employs are far superior to what other calculators are using. Take for example the real-time depth of cut/deflection optimization, that other calculators do in a separate window and take a few seconds to complete. The First Ever HSMAdvisor Speed and Feed Wizard hook for MasterCAM has been released today for everybody to download for free. Getting it to this stage has been a titanic effort for me and I am going to put a lot more of it in the coming months: i need to get it to pretty much perfect state before i start forgetting how i did all those things. Because of this each update i release will extend trial period by 30 days. This will last for as long as needed to finish the bulk of developing it. The only exception is: Coolant parameters are getting lost somewhere in the process. So please double check it before posting! Other Circular Toolpaths such as ThreadMilling etc. If you have any suggestions or find any bugs please let me know. I would like to reassure my current customers that HSMAdvisor Hook is/will be included with your license once this all is set and done. Please help me with your suggestions/bug reports make this thing even better for all of you! Cheers. And a huge "thank you" to everyone who has been supporting me! 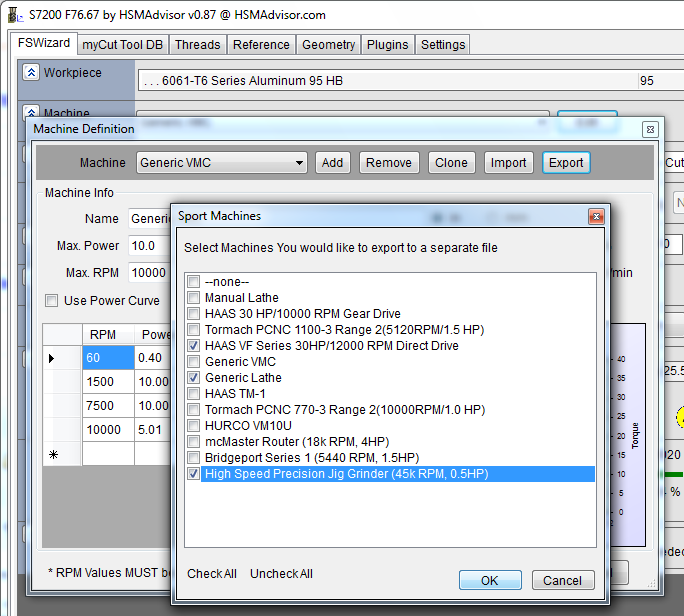 In the latest update to HSMAdvisor i have added Machine Definition Import and Export. Machine Definition manager opens up and there you click on "Import" button. A standard windows file-open dialog appears prompting you to select a file that contains the machine you wish to import. After selecting a file and pressing OK, you will be asked to choose which machine you would like to import from the file. This is necessary as each file may contain many definitions. Machine Definition manager opens up and there you click on "Export" button. A dialog appears where you are prompted to choose which machines from your current list you would like to export. After choosing your machines, click OK and select a file where you would like to save your machine list. I know you guys have created your own machines for your self. If you could use this new feature and send me your machines, that would be super sweet! You can also upload them onto our support forums by creating a thread. If there will be enough interest i will create a forum sub-category where users would be able to share their machines with each other. A little "Personal Touch" - i made a typo in the Export Machines window' title! Plugins Tab now has functionality to Download and Save webpages to your computer, so they are always available offline. There is now an address bar on the bottom of the screen. If you enter URL address and click go, you can load website in a new tab. Alternatively you can save your webpage in ".mht" format using Internet Explorer into HSMAdvisor\plugins\ folder. Next time you launch HSMAdvisor, your saved web page will show up in Plugins Tab. You can use *.HTML, *.HTM, *.MHT and *.TXT files. If you have any Microsoft Word documents you would like to keep there as well, you can save them "As Web Page" and copy to the plugins folder.